I am so happy to be back in Sullivan's Crossing! Robyn Carr's series grabbed me in Any Day Now and I can't stop myself from visiting the idyllic town. The Best of Us introduces the town's new resident, Leigh Culver, who has fallen in love with the people and her fulfilling role practicing medicine in a small community. Leigh convinces her Aunt Helen, who raised her after the death of her young mother, to visit and escape the Chicago winter. Aunt Helen's arrival sparks the beginning of a new chapter in their lives and the changes they face could make or break their relationship. Rob Shandon, introduced in The Family Gathering, never thought he'd ever consider marriage after the death of his wife nine years ago. But his whirlwind relationship with Leigh takes a complicated turn and he has to rethink the next phase of his life. I love how this story has drama from every angle of the story. From Helen and Sully to Finn and Maia, there is something extra to pull you into the lives of these ordinary people with big hearts. I thought it was interesting that two characters experienced life-changing events, but only one of them was life-threatening and actually made me wish that it was the focus of the novel, or maybe in a novel on its own. It didn't seem balanced to me, but in terms of upping the stakes and keeping reader interest that side drama did its job. 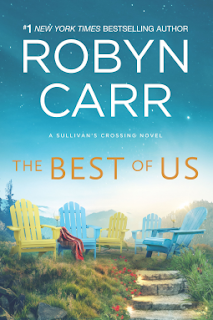 The Best of Us is a feel-good story that focuses on more than just romantic relationships. Helen and Leigh have more of a mother-daughter relationship that goes through it's ups and downs and is definitely far from perfect. I loved seeing them overcome misunderstandings and arguments and work towards building their separate lives while remaining close to each other. Don't miss this exciting entry into the Sullivan's Crossing series! It's perfect for fans of Mariah Stewart and RaeAnne Thayne!